Figure 8-26. - Control valve. hydraulic fluid under pressure to the proper location in the steering system. The control valve may be mounted either in the steering mechanism or on the steering linkage. depending on which system configuration is used. POWER STEERING HOSES - Power steering hoses are high-pressure. hydraulic rubber hoses that connect the power steering pump and the integral gearbox or power cylinder. One line serves as a supply line, the other acts as a return line to the reservoir of the power steering pump. There are three major types of power steering systems used on modern passenger vehicles (fig. 8-27) - integral piston (linkage type), external cylinder (linkage type), and rack and pinion. The rack and pinion can further be divided into integral and external power piston. The integral rack and pinion steering system is the most common. The integral piston (linkage type) power steering system has the hydraulic piston mounted inside the steering gearbox. This is the most common type of power steering system. Basically, this system consists of a power steering pump, hydraulic lines, and a special integral power-assist gearbox. The integral piston power steering gearbox (fig. 8-28) contains a conventional worm and sector gear arrangement, a hydraulic piston, and a control valve. 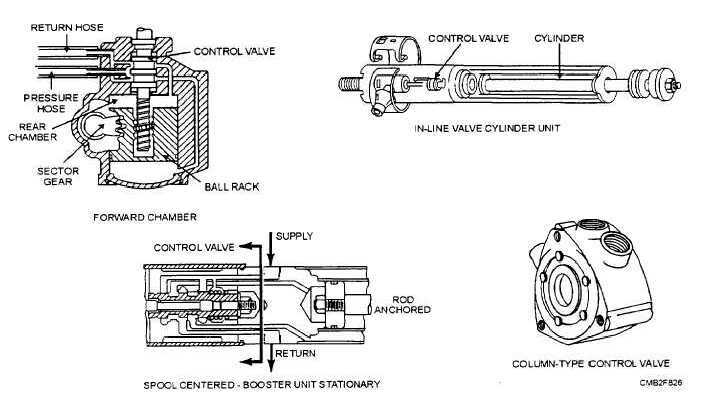 The control valve may be either a spool valve or a rotary valve depending upon manufacturer. With the steering wheel held straight ahead or in NEUTRAL position, the control valve balances hydraulic pressure on both sides of the power piston. Oil returns to the pump reservoir from the control valve. For a right turn, the control valve routes oil to the left side of the power piston. The piston is pushed to the right in the cylinder to aid pitman shaft rotation. For a left turn, the control valve routes oil to the right side of the power piston. The piston is pushed to the left in the cylinder to aid pitman shaft rotation. In both left and right turns piston movement forces oil on the nonpressurized side of the piston back through the control valve and to the pump.